until they heard news from their neighbor, Miss Brie. The news? That there's only a single drop of maple syrup left. And now the race is on! 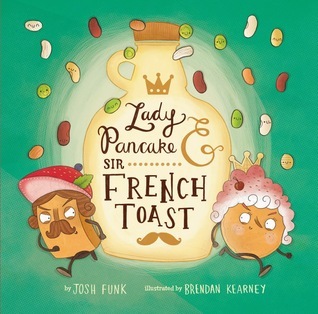 Both Lady Pancake & Sir French Toast are determined to be the one to use up that last drop of maple syrup. But there will be many obstacles in their way: the Broccoli Forest, the Orange Juice Fountain, and Potato Mash Mountain just to name a few. And just who is this Baron von Waffle guy? Wow! Thank you for the high praise about the rhymes. Like you seem to be, I am also very picky about my rhymes (although not picky about my foods). I worked for several years trying to figure out all the best ways to make rhyme and rhythm as accessible to everyone as possible, and I must admit, I'm still working on it and trying to improve. I'm glad you enjoyed my first dive into picture books.